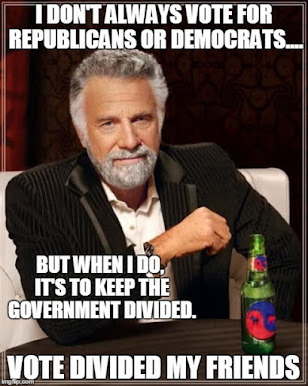 The Dividist Papers: Democrats shocked! shocked! to learn that Romney would pivot to the center! Democrats shocked! shocked! to learn that Romney would pivot to the center! Reaction to last week's debate continued to dominate the news cycle over the weekend, even overshadowing the drop in the unemployment rate reported by the Bureau of Labor Statistics on Friday. Despite the clear Team Obama preference for moving on to other topics, any other topic, it was left leaning publications, pundits, and satirists that kept the debate story front and center. Regardless of the treatment inside the issue, the cover is brutal. Particularly in the reference to the empty chair last seen during Clint Eastwood's GOP Convention performance. "The risk for the Obama campaign is that The Empty Chair is analogous to the Empty Suit - it invokes exactly the negative connotation that the GOP would like to associate with President Obama - that of an clueless, incompetent leader who is "not there". By early indications - that image is going to be front and center, squarely in the face of the electorate non-stop between now and the election. More people will see it and the connotation it carries than see both conventions combined. If you believe that images have the power to persuade and this election turns out to be as close as it looks now, it is entirely conceivable that Clint Eastwood just won the election for Mitt Romney." At least that question is now settled. 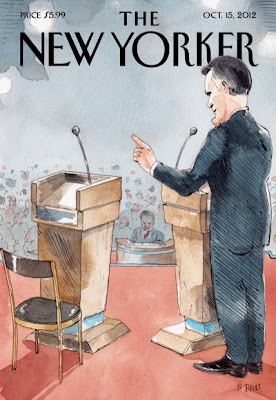 When the left-leaning New Yorker cover depicts an empty chair representing a MIA President, the only conclusion is that Clint Eastwood won. 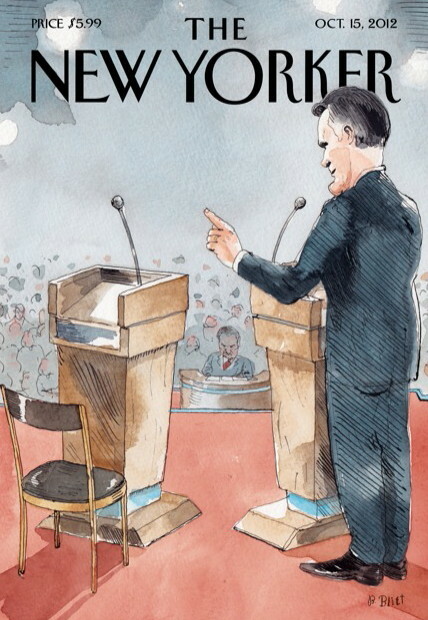 The image of the empty chair depicted on the New Yorker cover is exactly the image Eastwood intended and invoked at the convention. The reaction on the right to the debate was a predictable and consistent mixture of triumphalism and relief, best exemplified by the opening minutes of The Colbert Report. The response on the left was more interesting, spanning a range of rationalizations and emotions including: denial, anger, bargaining, depression, and acceptance. As John Stewart demonstrates, the comeback of choice for most Democratic partisans was to simply call Romney a liar. Of course both candidates lied during the debate. That is to be expected. Personally, I am dubious of the value of "Your guy lies more than my guy!" line of argument, but if anyone thinks it helps their team to "prove" the other candidate tells marginally more lies... hey - knock yourself out. The Obama campaign has two problems. First, as noted above, they'd like to get the media talking about anything else except the debate while their own supporters continue to call media attention to it with their harsh criticism and overwrought histrionics. Second, having invested heavily in demonizing Romney as the standard bearer of extreme right wing ideologues (war on women, war on Hispanics, war on gays, war on poor people, war on seniors, etc. 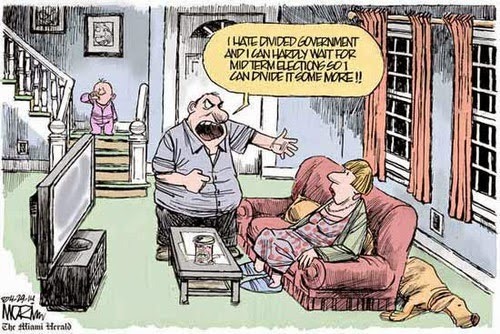 ), they seem inexplicably unwilling or unable to meet the new "Moderate Mitt" now campaigning against them. Every presidential candidate in the modern era moved to the center after securing their party's nomination. Obama did exactly the same in 2008. Romney's pivot to the center has to be the least surprising and most telegraphed political move in history. His own campaign adviser explained exactly what they were planning with his infamous etch-a-sketch comments. Obama senior campaign adviser David Axelrod on Sunday said Republican Mitt Romney delivered a “very good performance” at the first presidential debate that was “completely un-rooted in fact” and the president was “taken aback at the brazenness” of the Republican nominee's answers." Since this is coming out of Axelrod's mouth, we know that this is the very best officially sanctioned spin they've been able to come up with to explain the debate. They are just going to repeat the "Liar!, Liar! Liar!" refrain over and over and over again. That's it. I am trying to think of an example where that has ever worked in a presidential campaign. Maybe when John Kerry was "swiftboated" in 2004. Essentially that campaign was calling Kerry a liar. I dunno. Look - I get it. Team Obama would far prefer to run against their own carefully manufactured cartoon caricature of Romney. Who wouldn't? It's an easy target. But if Mitt Romney is not going to cooperate by supporting the positions that Team Obama are prepared to fight, perhaps they need to rethink this strategy. You can't fight a campaign war against the opponent you want, you have to fight the opponent you've got. Next up - the Vice President debate scheduled this Thursday. That may be the next best opportunity to stop the bleeding for the Obama campaign. Expectations are very low for Biden, but he was a killer debater in the 2008 Democratic primaries. He was articulate, showed a great command of the facts and relished the format. He was a far better debater than either Obama or Clinton. Expectations are very high for Ryan, but he does not have the experience debating at this level with this intensity of media scrutiny. I don't expect Ryan to pull a Palin, but I do expect a Ryan gaffe and a Biden win. We'll see where we go from there. Early indications are that the debate had an impact on the swing state polls. Whether it was enough and whether it holds up remains to be seen. My best guess now for the November election - Romney wins the popular vote and Obama wins the presidency in the electoral college.